There are two simple ways to determine if your pet has allergies. Some of the symptoms associated with allergies include itchy feet, itchy ears, inflammation of the skin, persistent scratching, chewing and face rubbing. Some pets lose hair and may experience rashes. Our Oral Allergy Treatment can be regionally formulated based on your pet’s symptoms. Your veterinarian will take blood serum and send it to be tested for a variety of inhalants such as trees, grasses and weed pollens, fungus (molds) and house dust mites that are specific to the region in which you live. 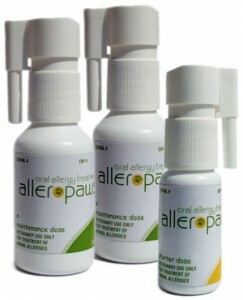 Our Oral Allergy Treatment can be formulated based on specific allergens. Please note: Skin testing may be used as well. Up until now, the most common way to treat a pet’s allergy was through allergy shots. Some pets cannot tolerate or don’t respond well to allergy shots. Our oral allergy treatment is an easy, effective alternative for treating your pet’s allergic condition. You’ll love allerpaws’ unique delivery system – a quick metered spray into the side of mouth or under your pet’s tongue. Over time your pet will build up a specific immune tolerance. This therapy has been successfully used in humans for the past 20 years in Europe. and what are the advantages? Sublingual Immunotherapy (SLIT) is an alternative yet practical emerging therapy for pets. An independent, two-year study funded by Nelco Vet and conducted by a leading veterinary medical university showed clinical improvement consistent with traditional subcutaneous immunotherapy (allergy shots). Oral allergy treatment is painless and easy to administer. It is not stressful or traumatizing to you or your pet. This spray treatment is formulated based on your pet’s specific allergy test results or regionally formulated based on an evaluation of the pet’s symptoms, and history of reactions to seasonally relevant outdoor and indoor allergens. How often do I treat my pet? For most pets, oral immunotherapy is effective when given daily. You will begin with a daily starter dose of three sprays into the side of the mouth or under the tongue. After a four week build up period, you will begin a maintenance dose (3 sprays, 6 days per week). All pets are different and it takes time for the pet’s immune system to build necessary antibodies. Pets progress at different rates. Many will show significant improvement in six months. Others will take up to one year before improvement is noted. It is critical that treament be continued for at least one year. What are the possible side effects to my pet? Adverse reactions to allergenic extracts are extremely rare when administered orally. Signs and symptoms of possible side effects would include the following: facial swelling, redness, itching and tingling of the mouth, excessive drooling, sneezing and panting. Usually a simple reduction in volume given is all that is required. Your veterinarian may suggest giving liquid antihistamine, such as over-the-counter, generic cetirizine or diphenhydramine. Where can I get Allerpaws? Our product is available only through veterinarians. Ask your veterinarian if Allerpaws is right for your pet. Our brochure outlining the benefits of our Oral Immunotherapy product and how to get it for your pet. Our dosage chart detailing the proper schedule for administering Allerpaws to your pet. We have pro­vided allergy test­ing and treat­ment prod­ucts for more than 35 years. As the first USDA-approved sup­plier of an oral allergy treat­ment spray prod­uct for your pet, we are a val­ued part­ner to vet­eri­nar­i­ans nationwide.